This article is about the material. For the process, see Soldering. Solder (/ˈsoʊldər/, /ˈsɒldər/ or in North America /ˈsɒdər/) is a fusible metal alloy used to create a permanent bond between metal workpieces. The word solder comes from the Middle English word soudur, via Old French solduree and soulder, from the Latin solidare, meaning "to make solid". In fact, solder must first be melted in order to adhere to and connect the pieces together after cooling, which requires that an alloy suitable for use as solder have a lower melting point than the pieces being joined. The solder should also be resistant to oxidative and corrosive effects that would degrade the joint over time. Solder used in making electrical connections also needs to have favorable electrical characteristics. Soft solder typically has a melting point range of 90 to 450 °C (190 to 840 °F; 360 to 720 K), and is commonly used in electronics, plumbing, and sheet metal work. Alloys that melt between 180 and 190 °C (360 and 370 °F; 450 and 460 K) are the most commonly used. Soldering performed using alloys with a melting point above 450 °C (840 °F; 720 K) is called "hard soldering", "silver soldering", or brazing. In specific proportions, some alloys can become eutectic — that is, their melting point is the same as their freezing point, and the alloy's melting point is lower than that of either component. Non-eutectic alloys have markedly different solidus and liquidus temperatures, and within that range they exist as a paste of solid particles in a melt of the lower-melting phase. In electrical work, if the joint is disturbed in the pasty state before it has solidified totally, a poor electrical connection may result; use of eutectic solder reduces this problem. The pasty state of a non-eutectic solder can be exploited in plumbing, as it allows molding of the solder during cooling, e.g. for ensuring watertight joint of pipes, resulting in a so-called "wiped joint". For electrical and electronics work, solder wire is available in a range of thicknesses for hand-soldering (manual soldering is performed using a soldering iron or soldering gun), and with cores containing flux. It is also available as a paste, as a preformed foil shaped to match the workpiece, more suitable for mechanized mass-production, or in small "tabs" that can be wrapped around the joint and melted with a flame, for field repairs where an iron isn't usable or available. Alloys of lead and tin were commonly used in the past and are still available; they are particularly convenient for hand-soldering. Lead-free solders have been increasing in use due to regulatory requirements plus the health and environmental benefits of avoiding lead-based electronic components. They are almost exclusively used today in consumer electronics. Plumbers often use bars of solder, much thicker than the wire used for electrical applications. Jewelers often use solder in thin sheets, which they cut into snippets. On July 1, 2006 the European Union Waste Electrical and Electronic Equipment Directive (WEEE) and Restriction of Hazardous Substances Directive (RoHS) came into effect, restricting the inclusion of lead in most consumer electronics sold in the EU, and having a broad effect on consumer electronics sold worldwide. In the US, manufacturers may receive tax benefits by reducing the use of lead-based solder. Lead-free solders in commercial use may contain tin, copper, silver, bismuth, indium, zinc, antimony, and traces of other metals. Most lead-free replacements for conventional 60/40 and 63/37 Sn-Pb solder have melting points from 5 to 20 °C higher, though there are also solders with much lower melting points. It may be desirable to use minor modification of the solder pots (e.g., titanium liners or impellers) used in wave-soldering, to reduce maintenance cost due to increased tin-scavenging of high-tin solder. Lead-free solder may be less desirable for critical applications, such as aerospace and medical projects, because its properties are less thoroughly known. Tin-silver-copper (Sn-Ag-Cu, or "SAC") solders are used by two-thirds of Japanese manufacturers for reflow and wave soldering, and by about 75% of companies for hand soldering. The widespread use of this popular lead-free solder alloy family is based on the reduced melting point of the Sn-Ag-Cu ternary eutectic behavior (217 °C), which is below the 22/78 Sn-Ag (wt.%) eutectic of 221 °C and the 59/41 Sn-Cu eutectic of 227 °C. The ternary eutectic behavior of Sn-Ag-Cu and its application for electronics assembly was discovered (and patented) by a team of researchers from Ames Laboratory, Iowa State University, and from Sandia National Laboratories-Albuquerque. Much recent research has focused on selection of 4th element additions to Sn-Ag-Cu to provide compatibility for the reduced cooling rate of solder sphere reflow for assembly of ball grid arrays, e.g., 18/64/14/4 tin-silver-copper-zinc (Sn-Ag-Cu-Zn) (melting range 217–220 °C) and 18/64/16/2 tin-silver-copper-manganese (Sn-Ag-Cu-Mn) (melting range of 211–215 °C). Tin-based solders readily dissolve gold, forming brittle intermetallics; for Sn-Pb alloys the critical concentration of gold to embrittle the joint is about 4%. Indium-rich solders (usually indium-lead) are more suitable for soldering thicker gold layer as the dissolution rate of gold in indium is much slower. Tin-rich solders also readily dissolve silver; for soldering silver metallization or surfaces, alloys with addition of silvers are suitable; tin-free alloys are also a choice, though their wettability is poorer. If the soldering time is long enough to form the intermetallics, the tin surface of a joint soldered to gold is very dull. the melting point is truly a point — not a range. The addition of tin—more expensive than lead—improves wetting properties of the alloy; lead itself has poor wetting characteristics. High-tin tin-lead alloys have limited use as the workability range can be provided by a cheaper high-lead alloy. Before recent requirements for lead-free products, electronic components on printed circuit (printed wiring) boards (PCBs) were connected to the etched-copper-foil circuit, and hence to other components, by soldered joints created either by hand with a soldering iron using flux-core eutectic or near-eutectic (60/40) wire solder, or by a wave soldering machine which applies a flux beforehand. However, boards using the finest-pitch surface mount technology usually use solder paste applied to each location to be soldered before the component is placed on the board. Lead-tin solders readily dissolve gold plating and form brittle intermetallics. 60/40 Sn-Pb solder oxidizes on the surface, forming a complex 4-layer structure: tin(IV) oxide on the surface, below it a layer of tin(II) oxide with finely dispersed lead, followed by a layer of tin(II) oxide with finely dispersed tin and lead, and the solder alloy itself underneath. Lead, and to some degree tin, as used in solder contains small but significant amounts of radioisotope impurities. Radioisotopes undergoing alpha decay are a concern due to their tendency to cause soft errors. Polonium-210 is especially problematic; lead-210 beta decays to bismuth-210 which then beta decays to polonium-210, an intense emitter of alpha particles. Uranium-238 and thorium-232 are other significant contaminants of alloys of lead. Electrical solder with an integrated resin core, visible as a dark spot in the cut end of the solder wire. Flux is a reducing agent designed to help reduce (return oxidized metals to their metallic state) metal oxides at the points of contact to improve the electrical connection and mechanical strength. The two principal types of flux are acid flux (sometimes called "active flux"), containing strong acids, used for metal mending and plumbing, and rosin flux (sometimes called "passive flux"), used in electronics. Rosin flux comes in a variety of "activities", corresponding roughly to the speed and effectiveness of the organic acid components of the rosin in dissolving metallic surface oxides, and consequently the corrosiveness of the flux residue. Due to concerns over atmospheric pollution and hazardous waste disposal, the electronics industry has been gradually shifting from rosin flux to water-soluble flux, which can be removed with deionized water and detergent, instead of hydrocarbon solvents. In contrast to using traditional bars or coiled wires of all-metal solder and manually applying flux to the parts being joined, much hand soldering since the mid-20th century has used flux-core solder. This is manufactured as a coiled wire of solder, with one or more continuous bodies of inorganic acid or rosin flux embedded lengthwise inside it. As the solder melts onto the joint, it frees the flux and releases that on it as well. Hard solders are used for brazing, and melt at higher temperatures. Alloys of copper with either zinc or silver are the most common. In silversmithing or jewelry making, special hard solders are used that will pass assay. They contain a high proportion of the metal being soldered and lead is not used in these alloys. These solders vary in hardness, designated as "enameling", "hard", "medium" and "easy". Enameling solder has a high melting point, close to that of the material itself, to prevent the joint desoldering during firing in the enameling process. The remaining solder types are used in decreasing order of hardness during the process of making an item, to prevent a previously soldered seam or joint desoldering while additional sites are soldered. Easy solder is also often used for repair work for the same reason. Flux is also used to prevent joints from desoldering. Silver solder is also used in manufacturing to join metal parts that cannot be welded. The alloys used for these purposes contain a high proportion of silver (up to 40%), and may also contain cadmium. The solidifying behavior depends on the alloy composition. Pure metals solidify at a certain temperature, forming crystals of one phase. Eutectic alloys also solidify at a single temperature, all components precipitating simultaneously in so-called coupled growth. Non-eutectic compositions on cooling start to first precipitate the non-eutectic phase; dendrites when it is a metal, large crystals when it is an intermetallic compound. Such a mixture of solid particles in a molten eutectic is referred to as a mushy state. Even a relatively small proportion of solids in the liquid can dramatically lower its fluidity. The temperature of total solidification is the solidus of the alloy, the temperature at which all components are molten is the liquidus. The mushy state is desired where a degree of plasticity is beneficial for creating the joint, allowing filling larger gaps or being wiped over the joint (e.g. when soldering pipes). In hand soldering of electronics it may be detrimental as the joint may appear solidified while it is not yet. Premature handling of such joint then disrupts its internal structure and leads to compromised mechanical integrity. Antimony is added to increase strength without affecting wettability. Prevents tin pest. Should be avoided on zinc, cadmium, or galvanized metals as the resulting joint is brittle. Bismuth significantly lowers the melting point and improves wettability. In presence of sufficient lead and tin, bismuth forms crystals of Sn16Pb32Bi52 with melting point of only 95 °C, which diffuses along the grain boundaries and may cause a joint failure at relatively low temperatures. A high-power part pre-tinned with an alloy of lead can therefore desolder under load when soldered with a bismuth-containing solder. Such joints are also prone to cracking. Alloys with more than 47% Bi expand upon cooling, which may be used to offset thermal expansion mismatch stresses. Retards growth of tin whiskers. Relatively expensive, limited availability. Copper improves resistance to thermal cycle fatigue, and improves wetting properties of the molten solder. It also slows down the rate of dissolution of copper from the board and part leads in the liquid solder. Copper in solders forms intermetallic compounds. Supersaturated (by about 1%) solution of copper in tin may be employed to inhibit dissolution of thin-film under-bump metallization of BGA chips, e.g. as Sn94Ag3Cu3. Nickel can be added to the solder alloy to form a supersaturated solution to inhibit dissolution of thin-film under-bump metallization. In tin-copper alloys, small addition of Ni (<0.5 wt%) inhibits the formation of voids and interdiffusion of Cu and Sn elements. Indium lowers the melting point and improves ductility. In presence of lead it forms a ternary compound that undergoes phase change at 114 °C. Very high cost (several times of silver), low availability. Easily oxidizes, which causes problems for repairs and reworks, especially when oxide-removing flux cannot be used, e.g. during GaAs die attachment. Indium alloys are used for cryogenic applications, and for soldering gold as gold dissolves in indium much less than in tin. Indium can also solder many nonmetals (e.g. glass, mica, alumina, magnesia, titania, zirconia, porcelain, brick, concrete, and marble). Prone to diffusion into semiconductors and cause undesired doping. At elevated temperatures easily diffuses through metals. Low vapor pressure, suitable for use in vacuum systems. Forms brittle intermetallics with gold; indium-rich solders on thick gold are unreliable. Indium-based solders are prone to corrosion, especially in presence of chloride ions. Lead is inexpensive and has suitable properties. Worse wetting than tin. Toxic, being phased out. Retards growth of tin whiskers, inhibits tin pest. Lowers solubility of copper and other metals in tin. Silver provides mechanical strength, but has worse ductility than lead. In absence of lead, it improves resistance to fatigue from thermal cycles. Using SnAg solders with HASL-SnPb-coated leads forms SnPb36Ag2 phase with melting point at 179 °C, which moves to the board-solder interface, solidifies last, and separates from the board. Addition of silver to tin significantly lowers solubility of silver coatings in the tin phase. In eutectic tin-silver (3.5% Ag) alloy it tends to form platelets of Ag3Sn, which, if formed near a high-stress spot, may serve as initiating sites for cracks; silver content needs to be kept below 3% to inhibit such problems. Tin is the usual main structural metal of the alloy. It has good strength and wetting. On its own it is prone to tin pest, tin cry, and growth of tin whiskers. Readily dissolves silver, gold and to less but still significant extent many other metals, e.g. copper; this is a particular concern for tin-rich alloys with higher melting points and reflow temperatures. Zinc lowers the melting point and is low-cost. However it is highly susceptible to corrosion and oxidation in air, therefore zinc-containing alloys are unsuitable for some purposes, e.g. wave soldering, and zinc-containing solder pastes have shorter shelf life than zinc-free. Can form brittle Cu-Zn intermetallic layers in contact with copper. Readily oxidizes which impairs wetting, requires a suitable flux. Germanium in tin-based lead-free solders influences formation of oxides; at below 0.002% it increases formation of oxides. Optimal concentration for suppressing oxidation is at 0.005%. Rare-earth elements, when added in small amounts, refine the matrix structure in tin-copper alloys by seggregating impurities at the grain boundaries. However, excessive addition results in the formation of tin whiskers; it also results in suprious rare earth phases, which easily oxidize and deteriorate the solder properties. Impurities usually enter the solder reservoir by dissolving the metals present in the assemblies being soldered. Dissolving of process equipment is not common as the materials are usually chosen to be insoluble in solder. Aluminium – little solubility, causes sluggishness of solder and dull gritty appearance due to formation of oxides. Addition of antimony to solders forms Al-Sb intermetallics that are segregated into dross. Gold – easily dissolves, forms brittle intermetallics, contamination above 0.5% causes sluggishness and decreases wetting. Lowers melting point of tin-based solders. Higher-tin alloys can absorb more gold without embrittlement. Iron – forms intermetallics, causes grittiness, but rate of dissolution is very low; readily dissolves in lead-tin above 427 °C. Many different intermetallic compounds are formed during solidifying of solders and during their reactions with the soldered surfaces. The intermetallics form distinct phases, usually as inclusions in a ductile solid solution matrix, but also can form the matrix itself with metal inclusions or form crystalline matter with different intermetallics. Intermetallics are often hard and brittle. Finely distributed intermetallics in a ductile matrix yield a hard alloy while coarse structure gives a softer alloy. A range of intermetallics often forms between the metal and the solder, with increasing proportion of the metal; e.g. forming a structure of Cu-Cu3Sn-Cu6Sn5-Sn. Layers of intermetallics can form between the solder and the soldered material. These layers may cause mechanical reliability weakening and brittleness, increased electrical resistance, or electromigration and formation of voids. The gold-tin intermetallics layer is responsible for poor mechanical reliability of tin-soldered gold-plated surfaces where the gold plating did not completely dissolve in the solder. Gold and palladium readily dissolve in solders. Copper and nickel tend to form intermetallic layers during normal soldering profiles. Indium forms intermetallics as well. Indium-gold intermetallics are brittle and occupy about 4 times more volume than the original gold. Bonding wires are especially susceptible to indium attack. Such intermetallic growth, together with thermal cycling, can lead to failure of the bonding wires. Copper plated with nickel and gold is often used. The thin gold layer facilitates good solderability of nickel as it protects the nickel from oxidation; the layer has to be thin enough to rapidly and completely dissolve so bare nickel is exposed to the solder. Lead-tin solder layers on copper leads can form copper-tin intermetallic layers; the solder alloy is then locally depleted of tin and form a lead-rich layer. The Sn-Cu intermetallics then can get exposed to oxidation, resulting in impaired solderability. Two processes play a role in a solder joint formation: interaction between the substrate and molten solder, and solid-state growth of intermetallic compounds. The base metal dissolves in the molten solder in an amount depending on its solubility in the solder. The active constituent of the solder reacts with the base metal with a rate dependent on the solubility of the active constituents in the base metal. The solid-state reactions are more complex – the formation of intermetallics can be inhibited by changing the composition of the base metal or the solder alloy, or by using a suitable barrier layer to inhibit diffusion of the metals. Ag3Sn - at higher concentration of silver (over 3%) in tin forms platelets that can serve as crack initiation sites. AuSn4 – β-phase – brittle, forms at excess of tin. Detrimental to properties of tin-based solders to gold-plated layers. Glass solders are used to join glasses to other glasses, ceramics, metals, semiconductors, mica, and other materials, in a process called glass frit bonding. The glass solder has to flow and wet the soldered surfaces well below the temperature where deformation or degradation of either of the joined materials or nearby structures (e.g., metallization layers on chips or ceramic substrates) occurs. The usual temperature of achieving flowing and wetting is between 450 and 550 °C (840 and 1,020 °F). Two types of glass solders are used: vitreous, and devitrifying. Vitreous solders retain their amorphous structure during remelting, can be reworked repeatedly, and are relatively transparent. Devitrifying solders undergo partial crystallization during solidifying, forming a glass-ceramic, a composite of glassy and crystalline phases. Devitrifying solders usually create a stronger mechanical bond, but are more temperature-sensitive and the seal is more likely to be leaky; due to their polycrystalline structure they tend to be translucent or opaque. Devitrifying solders are frequently "thermosetting", as their melting temperature after recrystallization becomes significantly higher; this allows soldering the parts together at lower temperature than the subsequent bake-out without remelting the joint afterwards. Devitrifying solders frequently contain up to 25% zinc oxide. In production of cathode ray tubes, devitrifying solders based on PbO-B2O3-ZnO are used. Very low temperature melting glasses, fluid at 200–400 °C (390–750 °F), were developed for sealing applications for electronics. They can consist of binary or ternary mixtures of thallium, arsenic and sulfur. Zinc-silicoborate glasses can also be used for passivation of electronics; their coefficient of thermal expansion must match silicon (or the other semiconductors used) and they must not contain alkaline metals as those would migrate to the semiconductor and cause failures. The bonding between the glass or ceramics and the glass solder can be either covalent, or, more often, van der Waals. The seal can be leak-tight; glass soldering is frequently used in vacuum technology. Glass solders can be also used as sealants; a vitreous enamel coating on iron lowered its permeability to hydrogen 10 times. Glass solders are frequently used for glass-to-metal seals and glass-ceramic-to-metal seals. Glass solders are available as frit powder with grain size below 60 micrometers. They can be mixed with water or alcohol to form a paste for easy application, or with dissolved nitrocellulose or other suitable binder for adhering to the surfaces until being melted. The eventual binder has to be burned off before melting proceeds, requiring careful firing regime. The solder glass can be also applied from molten state to the area of the future joint during manufacture of the part. Due to their low viscosity in molten state, lead glasses with high PbO content (often 70–85%) are frequently used. The most common compositions are based on lead borates (leaded borate glass or borosilicate glass). Smaller amount of zinc oxide or aluminium oxide can be added for increasing chemical stability. Phosphate glasses can be also employed. Zinc oxide, bismuth trioxide, and copper(II) oxide can be added for influencing the thermal expansion; unlike the alkali oxides, these lower the softening point without increasing of thermal expansion. Glass solders are frequently used in electronic packaging. CERDIP packagings are an example. Outgassing of water from the glass solder during encapsulation was a cause of high failure rates of early CERDIP integrated circuits. Removal of glass-soldered ceramic covers, e.g., for gaining access to the chip for failure analysis or reverse engineering, is best done by shearing; if this is too risky, the cover is polished away instead. As the seals can be performed at much lower temperature than with direct joining of glass parts and without use of flame (using a temperature-controlled kiln or oven), glass solders are useful in applications like subminiature vacuum tubes or for joining mica windows to vacuum tubes and instruments (e.g., Geiger tube). Thermal expansion coefficient has to be matched to the materials being joined and often is chosen in between the coefficients of expansion of the materials. In case of having to compromise, subjecting the joint to compression stresses is more desirable than to tensile stresses. The expansion matching is not critical in applications where thin layers are used on small areas, e.g., fireable inks, or where the joint will be subjected to a permanent compression (e.g., by an external steel shell) offsetting the thermally introduced tensile stresses. Glass solder can be used as an intermediate layer when joining materials (glasses, ceramics) with significantly different coefficient of thermal expansion; such materials cannot be directly joined by diffusion welding. Evacuated glazing windows are made of glass panels soldered together. A glass solder is used, e.g., for joining together parts of cathode ray tubes and plasma display panels. Newer compositions lowered the usage temperature from 450 to 390 °C (840 to 730 °F) by reducing the lead(II) oxide content down from 70%, increasing the zinc oxide content, adding titanium dioxide and bismuth(III) oxide and some other components. The high thermal expansion of such glass can be reduced by a suitable ceramic filler. Lead-free solder glasses with soldering temperature of 450 °C (842 °F) were also developed. Phosphate glasses with low melting temperature were developed. One of such compositions is phosphorus pentoxide, lead(II) oxide, and zinc oxide, with addition of lithium and some other oxides. Conductive glass solders can be also prepared. A preform is a pre-made shape of solder specially designed for the application where it is to be used. Many methods are used to manufacture the solder preform, stamping being the most common. 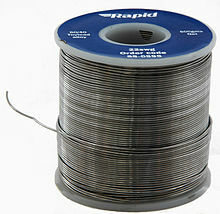 The solder preform may include the solder flux needed for the soldering process. This can be an internal flux, inside the solder preform, or external, with the solder preform coated. ^ a b "solder". Oxford Dictionaries. ^ Harper, Douglas. "solder". Online Etymology Dictionary. ^ Ogunseitan, Oladele A. (2007). "Public health and environmental benefits of adopting lead-free solders". Journal of the Minerals, Metals & Materials Society. 59 (7): 12–17. doi:10.1007/s11837-007-0082-8. ^ a b Sanka Ganesan; Michael Pecht (2006). Lead-free electronics. Wiley. p. 110. ISBN 978-0-471-78617-7. ^ a b c d e Meng Zhao (2019). "Structure and properties of Sn-Cu lead-free solders in electronics packaging". 20. ^ a b c Howard H. Manko (2001). Solders and soldering: materials, design, production, and analysis for reliable bonding. McGraw-Hill Professional. p. 164. ISBN 978-0-07-134417-3. ^ "Basic Info on Tin Whiskers". nepp.nasa.gov. Retrieved 27 March 2018. ^ Craig Hillman; Gregg Kittlesen & Randy Schueller. "A New (Better) Approach to Tin Whisker Mitigation" (PDF). DFR Solutions. Retrieved 23 October 2013. ^ Properties of Solders. farnell.com. ^ "U.S. Code: Title 42. The Public Health and Welfare" (PDF). govinfo.gov. p. 990. ^ H.L. Needleman; et al. (1990). "The long-term effects of exposure to low doses of lead in childhood. An 11-year follow-up report". The New England Journal of Medicine. 322 (2): 83–8. doi:10.1056/NEJM199001113220203. PMID 2294437. ^ Joseph R. Davis (2001). Alloying: understanding the basics. ASM International. p. 538. ISBN 978-0-87170-744-4. ^ A. C. Tan (1989). Lead finishing in semiconductor devices: soldering. World Scientific. p. 45. ISBN 978-9971-5-0679-7. ^ Madhav Datta; Tetsuya Ōsaka; Joachim Walter Schultze (2005). Microelectronic packaging. CRC Press. p. 196. ISBN 978-0-415-31190-8. ^ a b Karl J. Puttlitz; Kathleen A. Stalter (2004). Handbook of lead-free solder technology for microelectronic assemblies. CRC Press. p. 541. ISBN 978-0-8247-4870-8. ^ "The Fluidity of the Ni-Modified Sn-Cu Eutectic Lead-Free Solder" (PDF). Retrieved 20 August 2016. ^ Kaushish (2008). Manufacturing Processes. PHI Learning Pvt. Ltd. p. 378. ISBN 978-81-203-3352-9. ^ I. R. Walker (2011). Reliability in Scientific Research: Improving the Dependability of Measurements, Calculations, Equipment, and Software. Cambridge University Press. pp. 160–. ISBN 978-0-521-85770-3. ^ "Balver Zinn Desoxy RSN" (PDF). balverzinn.com. Retrieved 27 March 2018. ^ a b Michael Pecht (1993). Soldering processes and equipment. Wiley-IEEE. p. 18. ISBN 978-0-471-59167-2. ^ "Solder selection for photonic packaging". Retrieved 20 August 2016. ^ Indium Solder Encapsulating Gold Bonding Wire Leads to Fragile Gold-Indium Compounds and an Unreliable Condition that Results in Wire Interconnection Rupture. GSFC NASA Advisory]. (PDF) . Retrieved on 2019-03-09. ^ Jennie S. Hwang (1996). Modern solder technology for competitive electronics manufacturing. McGraw-Hill Professional. p. 397. ISBN 978-0-07-031749-9. ^ D. R. Frear; Steve Burchett; Harold S. Morgan; John H. Lau (1994). The Mechanics of solder alloy interconnects. Springer. p. 51. ISBN 978-0-442-01505-3. ^ Merrill L. Minges (1989). Electronic Materials Handbook: Packaging. ASM International. p. 239. ISBN 978-0-87170-285-2. ^ a b Walter Heinrich Kohl (1995). Handbook of materials and techniques for vacuum devices. Springer. p. 51. ISBN 978-1-56396-387-2. ^ Brian Caddy (2001). Forensic examination of glass and paint: analysis and interpretation. CRC Press. p. 40. ISBN 978-0-7484-0579-4. ^ Robert W. Messler (2004). Joining of materials and structures: from pragmatic process to enabling technology. Butterworth-Heinemann. p. 389. ISBN 978-0-7506-7757-8. ^ Alexander Roth (1994). Vacuum sealing techniques. Springer. p. 273. ISBN 978-1-56396-259-2. ^ Heinz G. Pfaender (1996). Schott guide to glass. Springer. p. 30. ISBN 978-0-412-62060-7. ^ Friedrich Beck (1998). Integrated circuit failure analysis: a guide to preparation techniques. John Wiley and Sons. p. 8. ISBN 978-0-471-97401-7. ^ Norbert Kockmann (2006). Micro process engineering: fundamentals, devices, fabrication, and applications. Wiley-VCH. p. 374. ISBN 978-3-527-31246-7. ^ Shirley Morris (2007). Interior Decoration – A Complete Course. Global Media. p. 96. ISBN 978-81-89940-65-2. ^ Dagmar Hülsenberg; Alf Harnisch; Alexander Bismarck (2008). Microstructuring of Glasses. Springer. ISBN 978-3-540-26245-9. 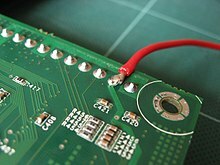 Wikimedia Commons has media related to Soldering. "Solder" . Encyclopædia Britannica. 25 (11th ed.). 1911. p. 374. This page was last edited on 3 April 2019, at 05:53 (UTC).